Basketball season is almost over and we are in the middle of baseball season. Football season will start soon, college and pro teams alike will be gearing up for the top spots in their conferences. Don’t wait until the season is over to makeover the bedroom or “man cave” for your little (or not so little) JJ Watt, Cam Newton, Stephen Curry, or Bryce Harper! 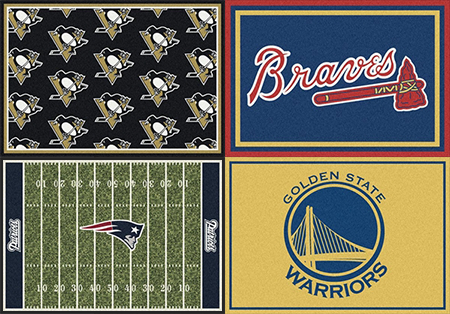 Milliken offers a great selection of fully endorsed MLB, NCAA, NBA, and NFL rugs. These rugs are available in several different styles and sizes to fit your sport fan’s taste. Sports Team Rugs that proudly display the team logo or mascot (aka spirit rugs), rugs that repeat the logo in a fashionable pattern (aka team repeat rug), or even as the playing field or court used by the pros. Show your team pride with a Milliken Sports Team Rug! 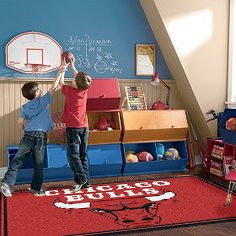 So get your athlete or super fan their favorite and make their room into their own field, court, or arena with a Milliken Sport collection rug. These rugs are ideal for pool rooms, home theatres (man-caves), kids rooms, rec rooms, or even the bedroom. Give American Carpet Wholesalers flooring experts a call at 800-548-2706 to get your own team rug!